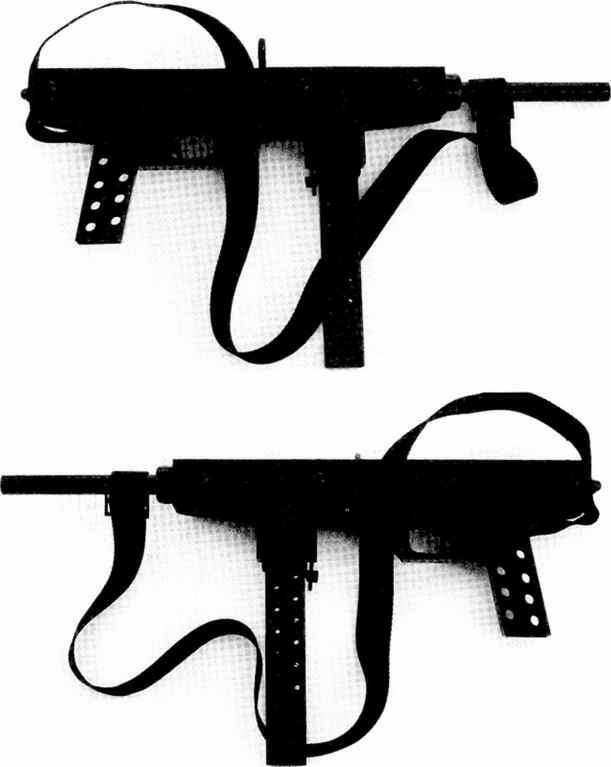 A sling is something of a necessity on any machine gun or rifle as an easy way of carrying the weapon. If a conventional rifle sling can be bought, this would be the obvious course of action. But, as with the weapon itself, we will assume this is not possible and an improvised sling must be used. A good source for sling material is the large cow and horse leads (reins) available from equestrian accessory shops. These are made from either canvas nylon or leather— exactly the same materials used for a machine gun or rifle sling. Usually these are about 1" wide, although a slightly smaller or larger width will suffice. A buckle must also be purchased so the length of the sling can be adjusted. The lead is cut to a length of approximately 4', and an 8 mm hole is cut approximately 1" in through one end of the lead. The dome nut is unscrewed from the recoil shield and the end of the lead is pushed over the protruding screw. Now a 1" mud wing washer with an 8 mm hole is slid onto the screw behind the lead and then the dome nut is screwed on. One end of the lead is now fixed securely to the rear of the receiver. The buckle is slid onto the opposite end of the lead for a length of approximately 7", then the 7" section is fed back through the buckle to create a loop. The loop is slid over the end of the barrel and the buckle adjusted so the sling is the correct length to suit individual requirements. 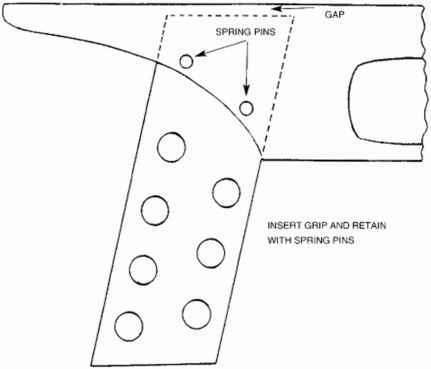 The hot bluing techniques employed by the professional gunsmith to finish and protect the steel of a firearm requires the use of special chemicals and equipment—not to mention the experience and time involved in carrying out this process effectively. Other books have covered this subject extensively, but the method is too complicated and time-consuming to be used on any firearm that can be called "expedient." Also, who would wish to spend days constructing hot bluing tanks and the heating apparatus required to heat the chemicals? The expedient machine gun is relatively quick to make once the necessary materials have been acquired. An equally quick method is required to enhance the appearance of the weapon and, more importantly, to protect the steel against the elements. Cold gun blue is the obvious choice here. It is available from all gun shops and is sold in liquid and paste form, though I would recommend the liquid version, since it is far easier and less messy to apply. I would recommend purchasing a one-gallon can (although quite expensive), which will make bluing easier and give a much better finish. The liquid is poured into a plastic container, i.e., a plastic washing-up bowl. The container should be long enough to allow the longest parts (i.e., the receivers) to be submerged in the gun blue. The weapon is stripped down completely to its major component parts, and the magazine is stripped as well. 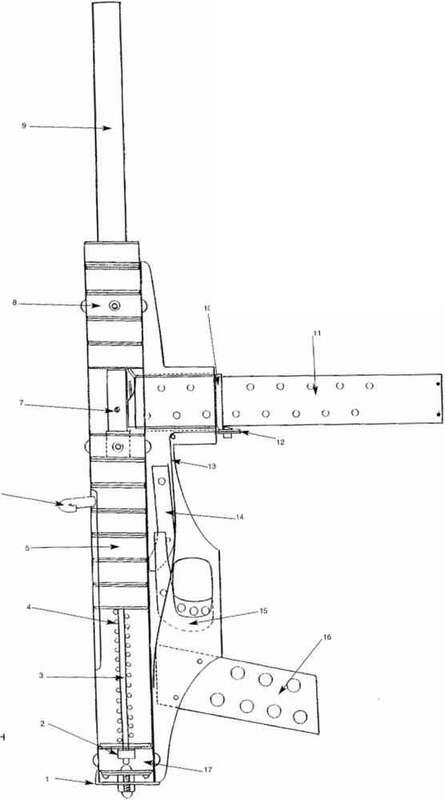 All collars are removed from the breech block and barrel, as well as from the inside of the receiver. As during construction, all external surfaces should be polished smooth. This must be done before the weapon is blued, since the liquid will not cover up any unsightly marks. 1 he better the gun's appearance beforehand, the better it will look after bluing. All parts must be degreased completely first, because any oils, including those present from simply handling the gun, can prevent the blue from penetrating the steel. All parts are washed in hot, soapy water (washing powder is ideal), then rinsed thoroughly in clean water and dried with a paper towel. Handling the parts directly after drying should be avoided. Also, note that hardware items (i.e., shaft lock collars) are often zinc plated, and since zinc will interfere with the bluing process, the zinc coating must be removed with a wash or quick soak in muriatic (hydrocholric) acid. (When it stops bubbling, all the zinc has been removed.) Then, to prevent rust, all the parts should be washed in a hot baking soda solution before the bluing process begins. All the components are slowly immersed into the gun blue. The steel will turn black immediately, but the parts should remain submerged for about 15 minutes to ensure maximum penetration of the liquid. After the parts are removed, they are wrapped in paper towels to absorb the excess liquids, unwrapped, and left to dry out thoroughly for several hours at room temperature. Rubbing or polishing the parts at this point is not recommended, as this will jeopardize the final finish. According to the instructions supplied with the cold gun blue, parts should be rinsed in clean water, dried, and then polished with a soft cloth. However, after years of using gun blue on both conventional and homemade firearms, I can assure you that the methods I am describing here result in the best-looking and most durable finish possible. The "rub it on and polish" instructions supplied with the product are to be ignored. When the parts are completely dry, they will display a thin film, brown in color, that looks like rust. Each part can now be polished using a fine or medium grade of steel wool. This should be done using very light pressure until the rust disappears and the blackened steel is visible underneath. Finally, each part is polished with a soft cloth, and the resulting finish will be an attractive one. The insides of all the tubes, barrel, block, magazine, and receivers should be checked to be sure they are polished and free from any dried-on gun blue residue. For the barrel and block, a barrel cleaning brush can be used, and for the inside of the other sections an appropriately sized wad of steel wool, pushed back and fourth inside the tubes, works well. A small amount of oil should now be applied to all internal sections of the weapon, with the exception of the barrel. Oil is also applied to the threads of the collars to ensure easy assembly/ disassembly of the weapon. The machine is now finished and can be reassembled. Cold gun blue can also be bought in small 3 fl. oz (90 ml) bottles at a fraction of the cost of a gallon can. Obviously, submerging the parts in liquid will give the most even finish, but if this amount cannot be obtained, one small bottle is enough to cover the whole weapon. The component parts are prepared in exactly the same way as described earlier, then the liquid is applied with a cotton wool swab. The advantage of this method is that no internal sections of the weapon need polishing since blue is only applied to the external surfaces. Using a swab to apply the gun blue does not give such a good finish as the submerging method, but is still perfectly satisfactory for an expedient firearm. As an alternative to bluing, the weapon can be finished to a case-hardened effect. This is my personal favorite, since it is truly expedient and only requires a gas torch and a small amount of oil. While this is not true case hardening, it is a similar good looking and durable finish, just as with bluing, all visible external surfaces must be polished smooth, but degreasing sections of the weapon is unnecessary for the following process. First the gun is stripped, but only down to its major component parts. The magazine is disassembled, but the pistol grip is not removed. With all necessary parts removed, the receivers are bolted together and the recoil shield inserted back into position. A small amount of light oil is smeared onto the external surfaces of the receiver assembly, but not too much; a few drops are perfectly adequate. Starting at one end of the assembly, the flame of a gas torch is applied approximately 1" from the surface of the steel. The flame should not be moved around but held in the same position for approximately 20 to 30 seconds until heat rings appear, which indicate that the steel has changed color. This process is repeated at intervals of about 2" along the entire length of both receivers until all sides have been heated and all oil has evaporated. The magazine body is finished in exactly the same way, but all internal parts are removed first, since any significant heat applied to a spring will destroy it. The barrel must not be finished using this process unless the two barrel tubes were silver-soldered together, since any significant heat applied to bearing adhesive will melt it. Barrel tubes held together with adhesive must either be blued or left the natural steel color. The full case-hardening colors will not become apparent until the steel has cooled partially, at which point, with the steel still warm, a small amount of oil is applied to the receiver assembly and magazine. With a steel wool wad of fine or medium grade, each side of the receivers, grip, and magazine is very lightly polished. The oil will prevent the steel wool from scratching and bring out the full color case-hardened effect. Finally, any surplus oil is wiped off with a clean cloth or paper towel and the weapon is reassembled. The end result is an attractive, durable finish and, best of all, is almost foolproof to create because the gas torch and oil do all the work. Remember, these are expedient finishes and are not intended to compete with the sophisticated methods employed in arms factories or gunsmith shops. Providing the machine gun is not dragged along the ground behind a pick-up truck, the blued or heat-colored finishes described here are quick to apply, attractive, and durable. Practicing with any homemade firearm is more important than with a factory-made counterpart, the latter weapon being made from high-quality materials on a production line, where each one made is identical to the last. Homemade firearms, on the other hand, will vary from weapon to weapon, depending on the person making them and the amount of time and care taken during manufacture. Getting to know one's own individual firearm—its reliability, firepower, eccentricities, and limitations—is of considerable importance, especially if a defense situation should arise. And, if the machine gun is used strictly for recreational purposes, no other firearm can come close to it for sheer shooting fun, at least not in my opinion! PHOTOS 55 AND 56: Right- and left-side view of the expedient machine gun, fully finished and sling fitted.